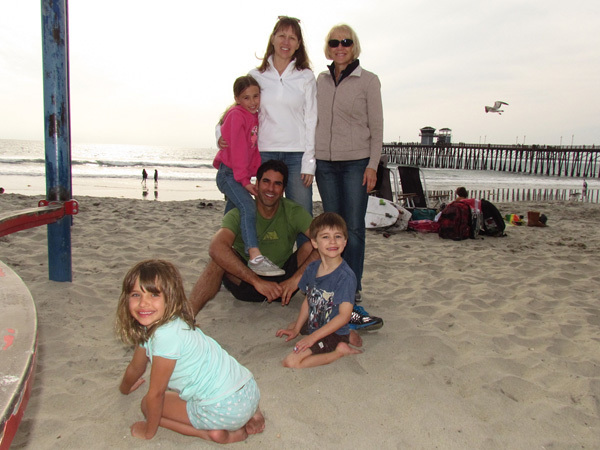 We flew to sunny California and spent ten glorious days, mostly with our kids and grandkids. 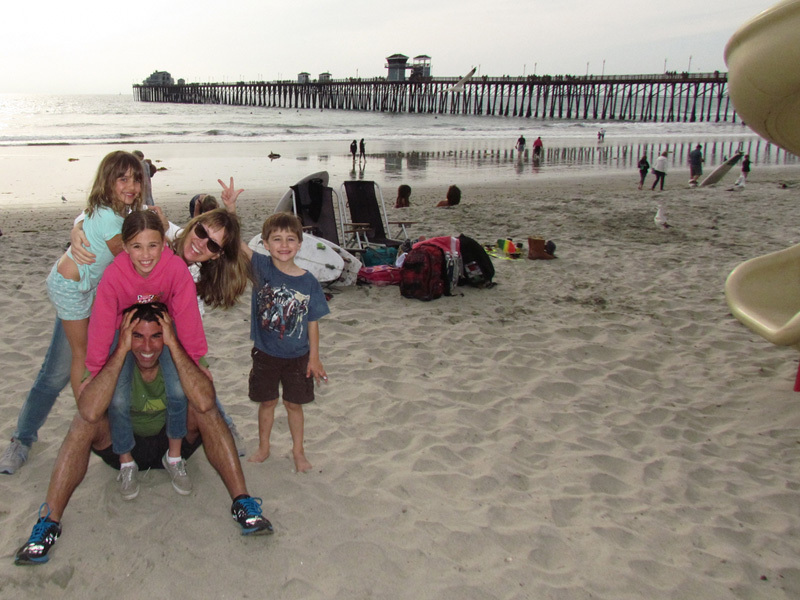 Here they are posing (as only they can) with the Oceanside Pier in the background. This picture was taken next to the timeshare we used to entertain the kids. 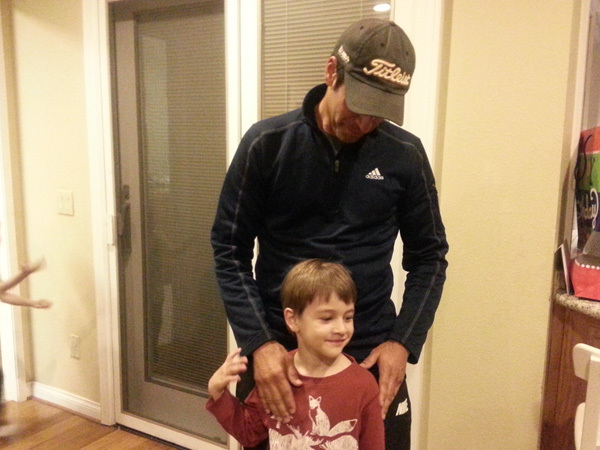 Hunter (who turned five) is the youngest of our five grandchildren--now 9, 8, 7, 6, and 5. Scott and Lois stayed with us until March 3rd. 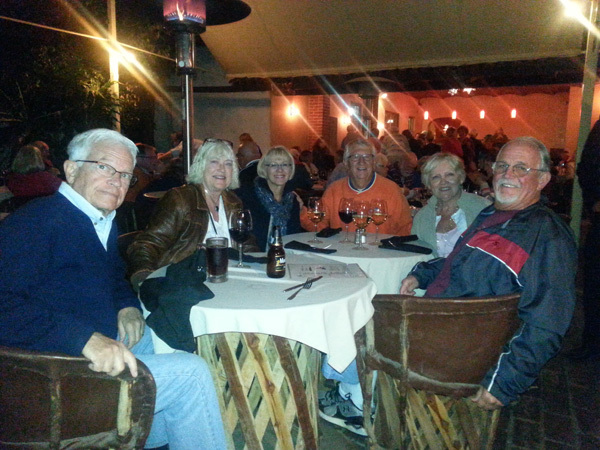 Here they joined us along with friends Chuck and Jean to take in Blue Jay Slim at Adalita's, one of our favorite restaurants. 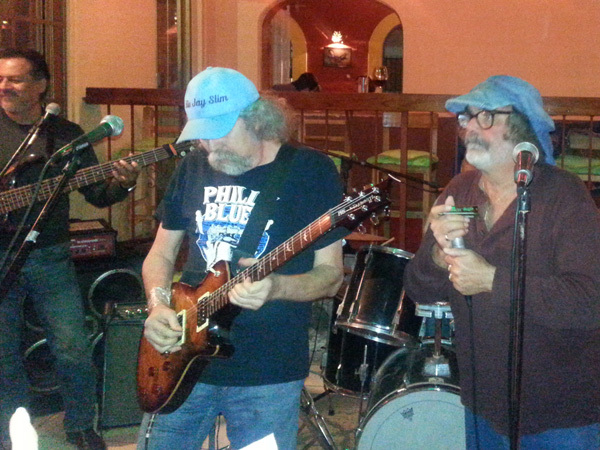 Blue Jay Slim, was inducted into the Blues Hall of Fame a few years ago and is starting to frequent Ajijic. Here he is playing with Larry's favorite harmonic players, Jay Shuffle. Friends Ron and Jean hosted a grand party at their home to celebrate Ron's birthday. 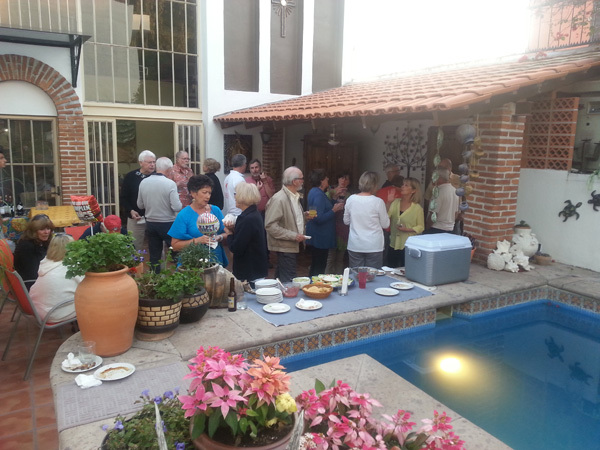 Great food and drinks and lots of wonderful people that make Ajijic so special. 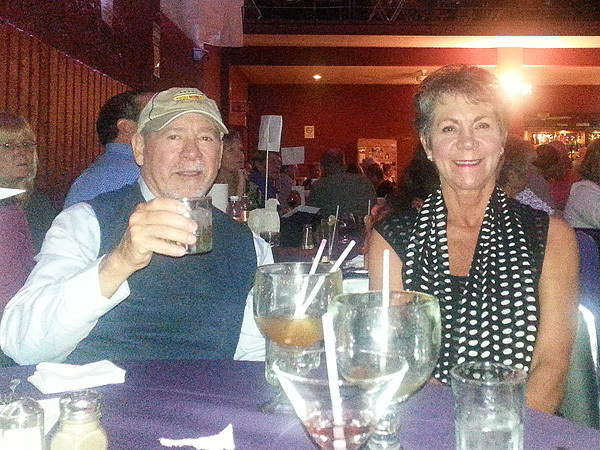 We attended the 4th annual fundraiser for Have Hammers--Will Travel (a local carpentry school). 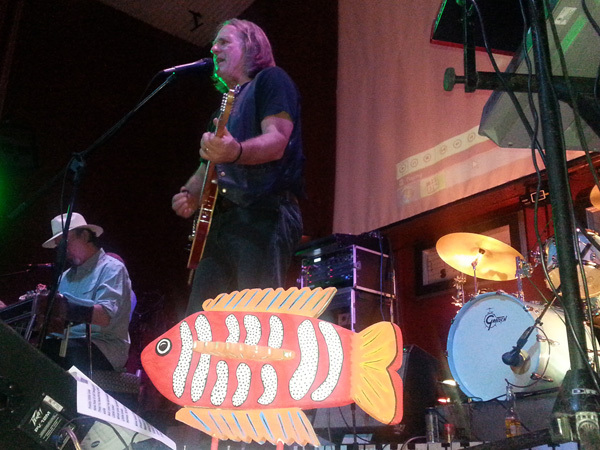 Dr. David Truly, lead guitarist in the Tallboys Band brought the house down! This event gave us a chance to catch up with friends Jerry and Gloria. Ajijic offers such varied opportunities, if you are not involved in the same activities, it's hard to stay in touch. On President's Day we took our grandkids to the Discovery Science Center. LEGOLAND Adventure was one of the themes and the kids had a great time playing with them. 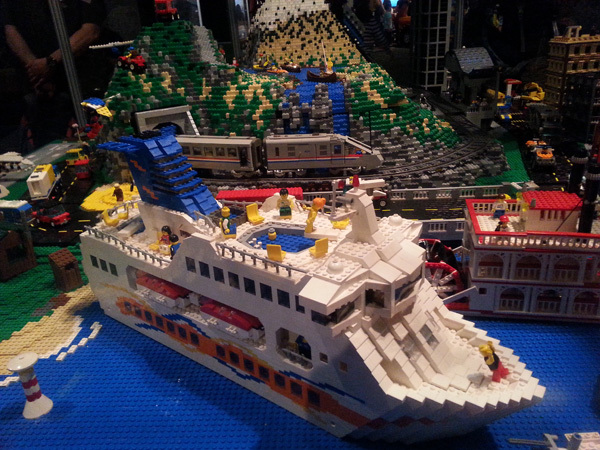 The Lego objects were not only intricate, but huge. 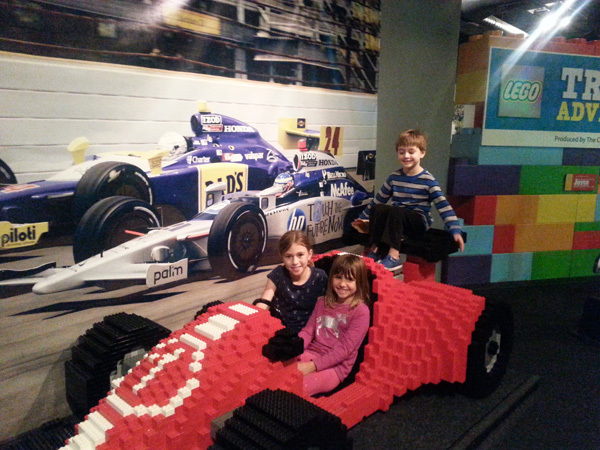 Here Dakota, Sierra and Hunter are posing on this formula one race car made out of LEGOs. 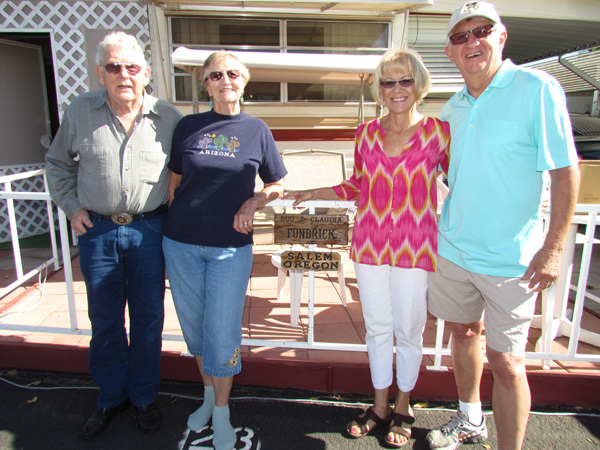 We drove to Earp, CA (on the border near Parker, Arizona) to visit Larry's sister Claudia and her husband Lou. Cards, casinos, eating and parties filled our time, but way to fast! 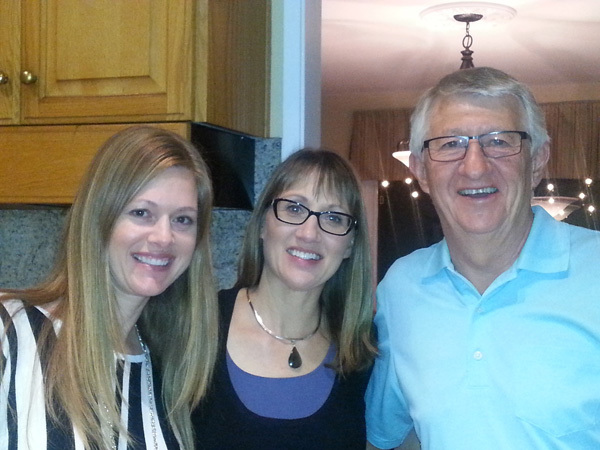 We attended LVs birthday party, one of Lou's closest friends who also winters here from Salem, Oregon. 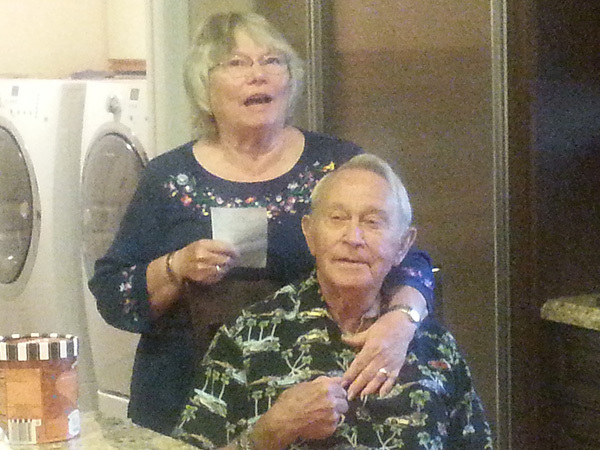 His wife Shirley sang the most beautiful birthday melody for him. 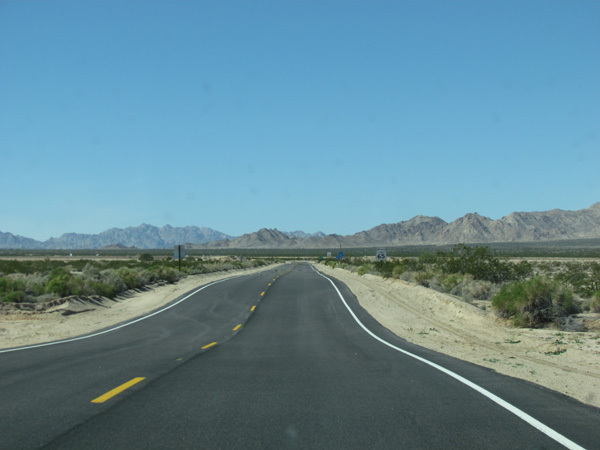 On the way back to Fullerton, we drove the back roads. Thank goodness it wasn't raining, because these dips along the way would have been flooded with two+ feet of water. 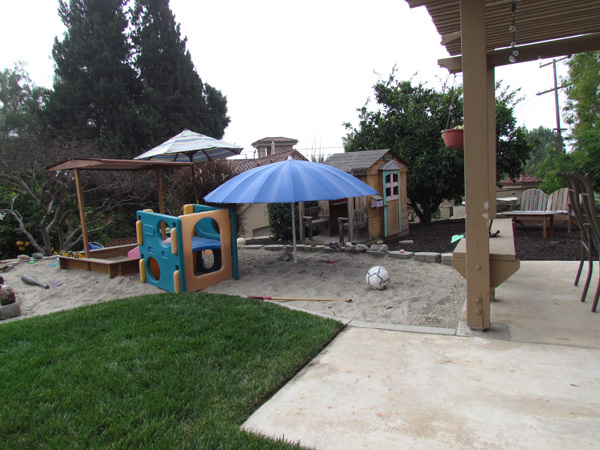 While Grandma Glorine helped Carmen in the garden, Hunter and Grandpa Larry worked on moving the sand box to a play area that was once a cactus garden. 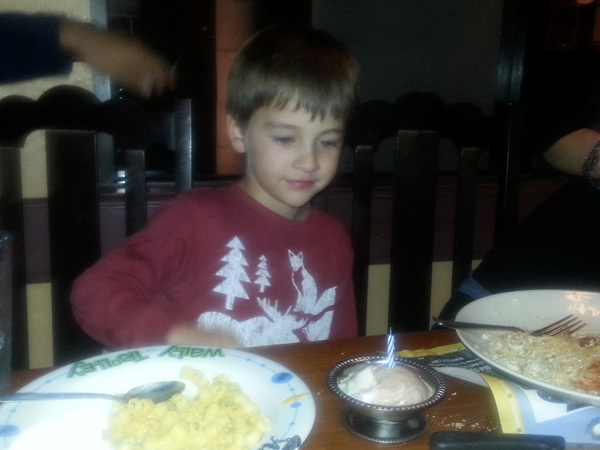 For Hunter's birthday, we all went to his favorite eatery--the Old Spaghetti Factory. 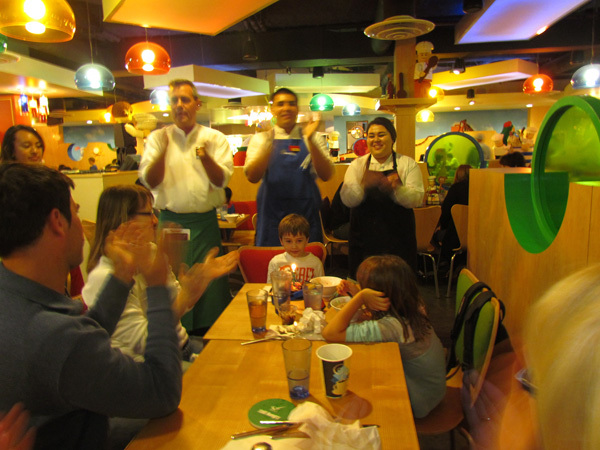 Instead of cake, he got ice cream with a candle on it, as staff sang him "Happy Birthday". When we got home from the restaurant, the lights were out and as Hunter walked in the house several of his preschool friends were there to shout SURPRISE!! In addition to LEGOs, Hunter is starting to enjoy toy soldiers and all the helicopters, tanks, amphibious assault vehicles, and other equipment that goes with them. Larry's niece Bryndon, from Minnesota was nearby attending a conference, so she stopped over to visit Carmen. It was delightful to be a part of the catching up! 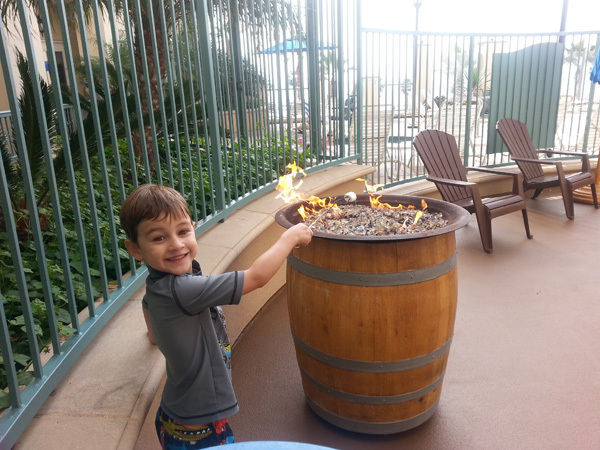 The day after Hunter's birthday, we took him to our timeshare at Oceanside Pier Resort. It was ten degrees cooler than Fullerton, so we stayed close to the resort. We took a break from the pool/hot tub to take advantage of Kids Activities. Here Hunter is roasting a marshmallow, in preparation for a s'mores, but he only ate the chocolate. The Jacuzzi tub in our room was a hit. 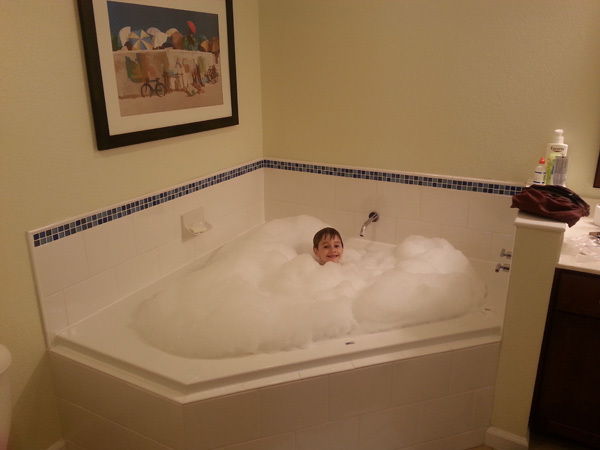 Hunter must have been in there five times over the weekend and especially enjoyed making and playing in the bubbles. 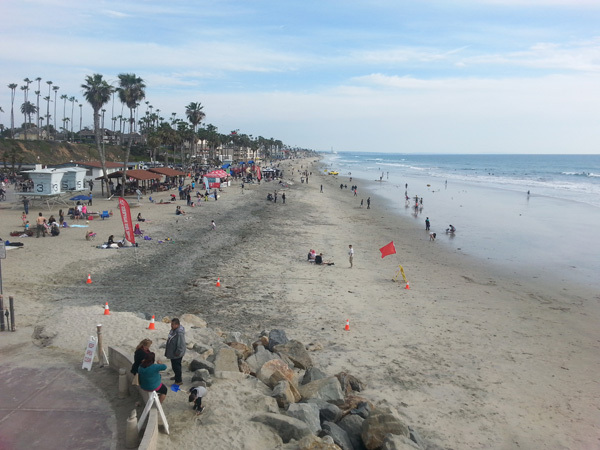 Oceanside borders Camp Pendleton, just north of San Diego and is billed as one of California best places for surfing. However, we decided to enjoy it from afar. 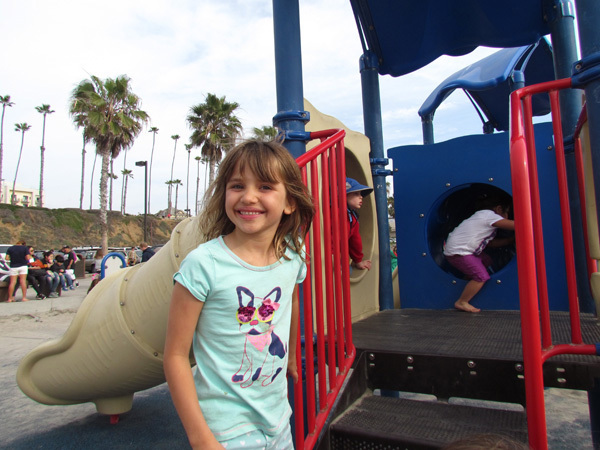 The playground on the beach was a big hit. It allowed the kids to spend some of their amazing energy. Here Sierra is playing tag with Grandpa Larry. He never could catch her. 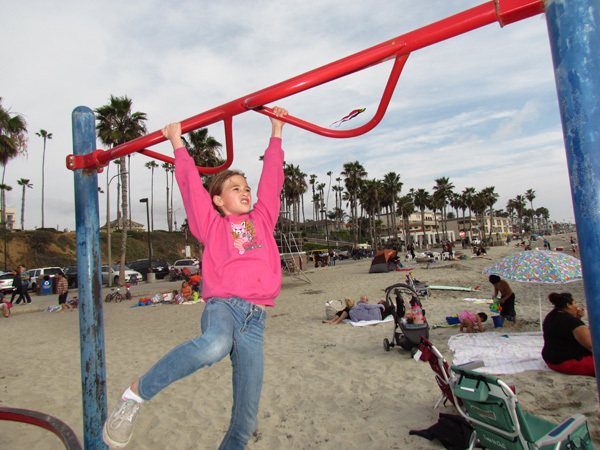 In the mean time, Dakota and Grandma Glorine were taking turns on the monkey bars. Like grandpa, there was no competition. 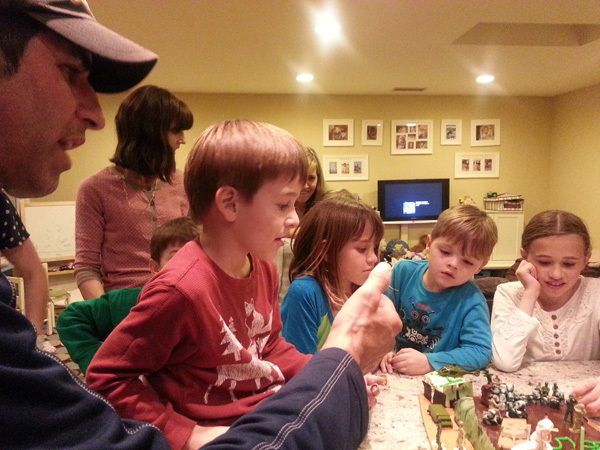 LEGOLAND is eight miles from our hotel, so we spent our last night with the kids creating more special memories celebrating Hunters birthday and building lots of LEGOs. 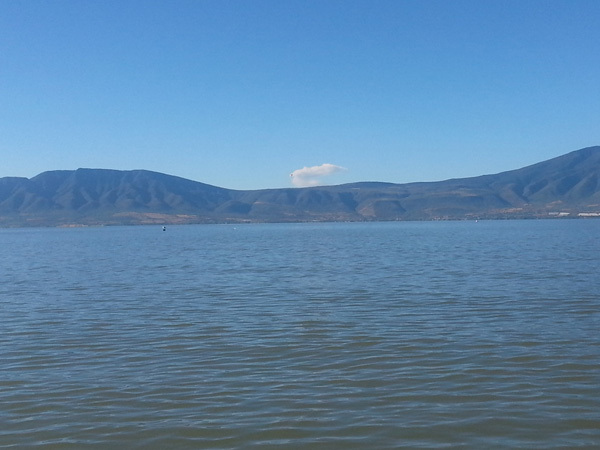 Back in Ajijic, we took our first kayak trip on Lake Chapala since coming down this year. Wayne, the Commodore of the Club, is now sporting some 40 members. Mount Colima, about 60 mile south-southwest of Ajijic is the most active volcano in Mexico. 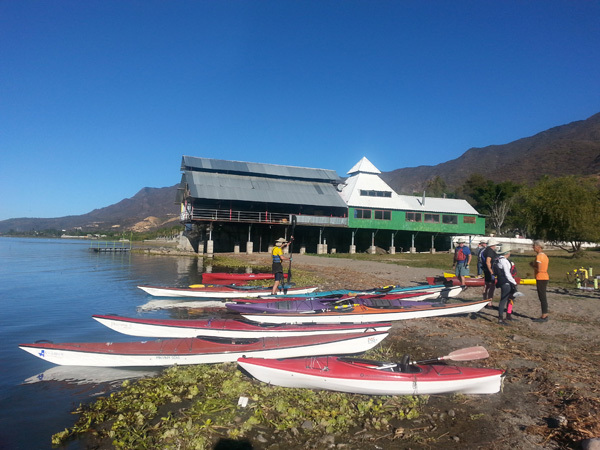 The morning of our kayaking, it left a plume of steam/ash estimated to be a mile high. Ajijic's 37th Annual Mexican Chili Cook-Off remains the area's largest charitable fund raiser. 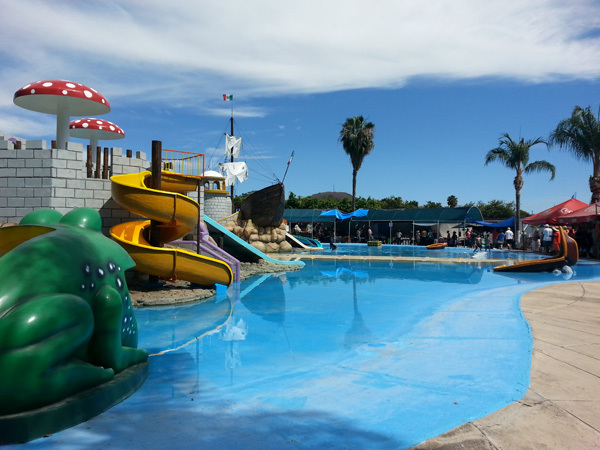 The Cook-Off was held at this beautiful water park located in Ajijic. The restaurant in the B&B we stayed at last year took top honors. Congrats! 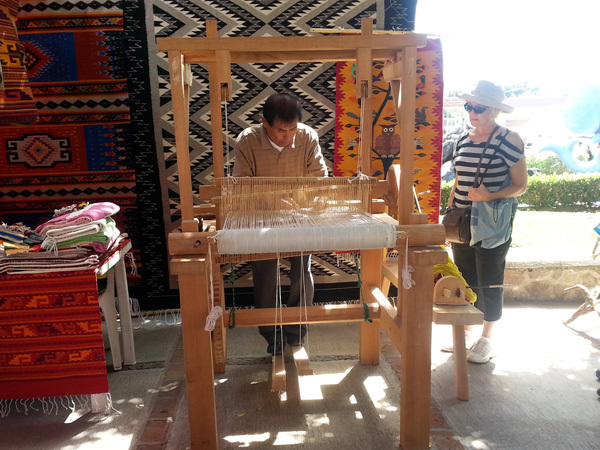 Vendors from throughout Mexico come to display their work and sometimes do it while they are here. Glorine has a loom about 1/8th this size and was quite impressed by their work. Ajijic is feeling more and more like HOME! Be and stay well! February's web page includes February 1 through February 28.